I’ve been a bit tardy with getting this post written (sorry – paid work has to come first.) but the memory of my day at the Grand Final of Sainsbury’s Great British Beer Hunt is still fresh in my mind. The supermarket deserves a big pat on the back for instigating a genuine celebration of British beers at a time when many seem to be rating ‘world beers’ over UK brews. My initial disappointment that Williams Brothers Profanity Stout hadn’t got through to the final was quickly put aside when, at the last minute, I was invited to join the judging panel. I didn’t need to be asked twice, and although it was my first time in such a capacity I felt confident I would make a thorough job of it. Worcester Sorcerer, Sadler’s Ales, Stourbridge. I was surprised that not only had Profanity Stout missed out, but also the accessible Golden Summer (perhaps the Indian summer arrived too late to encourage sales of this one) and Churchill Ale. It did make me wonder whether some stores had a beer or two missing which skewed the competition a little. Nevertheless, some great beers – and in my opinion some rather less than great ones – made it to the final and needed to be judged. I tasted and considered all of them as fairly as I could but for me there were three that stood out above the others: Wild Hop IPA, Bad King John and Hunter’s Bore. A further three were reasonable and drinkable, but nothing to write home about and two made me wonder how they had managed to get this far. When I dislike, or even hate, a beer I do realise that the next drinker might love it and if I’m writing or talking about it I’ll suggest to my audience that they try it for themselves as the enjoyment of beer can be a very personal and subjective thing. I’ve already written about how and why I didn’t like Sadler’s Worcester Sorcerer. I won’t repeat myself but I will add that a friend who accompanied me to the final said of it: “I felt like I was licking a beach, in the worst possible way.” She obviously didn’t like it any more than I did – but if you love this beer please comment on this post and stick up for it. I understand that Sadler’s also makes a cask version of it which I would like to try, but that’s for another blog post. The other finalist I disliked intensely was Joseph Holt’s Two Hoots. It seemed to be more evidence for the ‘clear bottles equals light struck, flavour-impaired beer’ argument as it had a sweaty, unpleasant flavour despite its attractive golden appearance. I gave it good marks for its label design though, because I’m a sucker for anything with owls on. The three reasonable and drinkable beers were: Caesar Augustus, Ivanhoe and Wye Not? If I went round someone’s house and they’d got me one of these I wouldn’t complain (ok, I might. In fact I did because my sister-in-law got a Caesar Augustus especially for me and I was gutted she hadn’t chosen the Wild Hop IPA so I tried to persuade my brother to let me have his bottle) but I wouldn’t be dancing a jig of glee either. Of the three that stood out, only the Wild Hop IPA was a dancing beer (see my previous post for an explanation of this term!). There was nothing I didn’t like about it. The other two fell more into the ‘ooh, yes’ category. 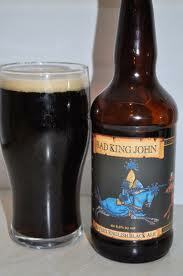 Bad King John is an incredibly tasty black bitter perfect for the dark half of the year and Full Bore a strong, specialist beer that cries out for a cheeseboard at the end of a meal. That beer is a drink full of surprises in more ways than one was demonstrated by Bad King John being crowned the winner of Sainsbury’s Great British Beer Hunt. A black bitter with huge depth of flavour triumphed over a number of other lighter and potentially easier-drinking brews – but then again the man behind it has more recommended beers in CAMRA’s Good Bottled Beer Guide than any other brewer. Peter Scholey also has more than 30 years experience on his a CV including the founding of his own Ridgeway Brewing after Brakspear’s, where he was head brewer, closed in 2002. Williams Brothers IPA/Lager Hybrid Caesar Augustus took second place. I’m looking forward to seeing Bad King John on the supermarket shelves but feel sad that this celebration of British beer has otherwise drawn to a close. My own celebrations of the UK’s beer will, of course, continue. I have tried and tried and tried to like *any* Holts beer and I just gave up eventually. There’s something stale and unpleasant about it, and at three quid a go, I just thought why make myself suffer? Nice to find your blog btw, which I found via get to the pub.com.